Ray Nolin is an ubiquitious Provincetown painter who trained with the legendary Philip Malicoat; exhibited at Berta Walker Gallery, Impulse Gallery, Shore Gallery, and Julie Heller Gallery; and has been profiled in Provincetown Arts magazine. His work is owned by the Provincetown Art Association & Museum and shows up regularly at auction. Norma Holt wrote about Nolin in her incredible book of Provincetown artists, On Equal Ground. And yet, Ray Nolin is a mystery. In all honesty, while I’ve never met the artist, I’ve heard stories about Nolin from people around town–stories best not repeated in print since they can’t be confirmed. In short, Nolin is a bit of character who beats out a life as an artist in Provincetown. For years, people would mention Nolin was working on a series of large charcoal renderings of Charles Hawthorne paintings, an homage to his mentor’s teacher. His former gallerist Michael LaBelle writes, “Nolin, like other artists who attempt to devote a life to creativity, has to sometimes improvise in the ongoing struggle to survive in an expensive and often thankless town that takes it for granted that artists can manage to stay afloat financially.” That is likely why Nolin resorted to painting seaside landscapes on cigar boxes. The inexpensive surfaces made for popular objects with tourists. Two of the paintings are of Wood End Lighthouse, and they are classic Provincetown works: a horizon line below the fold, so to say; water, beach, dune, and sky like layers of a cake simple, at first glance, but more complex when you study the subtle details of waves and clouds and dunes. 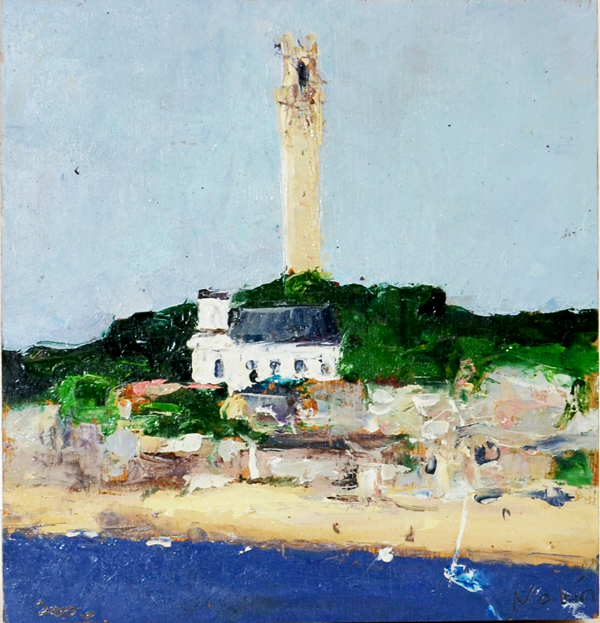 The third is a view of the village: the iconic Pilgrim’s Monument towering over the town which Nolin renders in dozens of messy colorful strokes. A sailboat drifts near the shore just above the artist’s signature.